Well, I haven’t posted in a week and here is why: attend graduation party, client meeting, make 2 dozen cookies for kindergarten awards ceremony, attend kindergarten awards ceremony, take Mr. D to guitar lessons, shop for Coco’s 6th birthday, make more cookies for Coco’s school birthday which is also the last day of school, attend school awards ceremony on last day of school, make miscellaneous food for Coco’s birthday party, Coco’s birthday party, monthly Seattle lunch with Architect friends, fight google redirect virus, take Miss G. to the mall and spend alone time with her, help Miss G. manufacture tennis balls for blind tennis camp….Yes, you read that correctly – blind tennis camp. Gabrielle is running a weeklong tennis camp for blind and visually impaired kids this week. She was inspired by my nephew, Humoody, who is blind and always wanted to play tennis like his cousins. We discovered that blind tennis was created in Japan and is quite popular there. 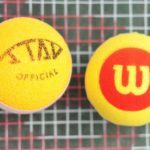 Now, I realize making your own blind tennis balls will appeal to only a tiny fraction of people, but if you are blind and you want to play tennis this post is for you. Blind tennis is played with softball-size foam balls that have a ping pong ball in the middle that makes sound. You can order 6 balls for $111.95 from the American Printing House for the Blind. Yes, you read correctly $18.66 per ball. Now, I mean no disrespect to the APHB, but they are as slow as molasses tar. I ordered balls two separate times and received my orders in approximately four months. So, with the cost and the slow shipping we decided to make our own for approximately $2-3 dollars per ball. Cut the foam ball in half. I used my small bandsaw and it worked great. On each foam half, center the circle template and trace with the sharpie. 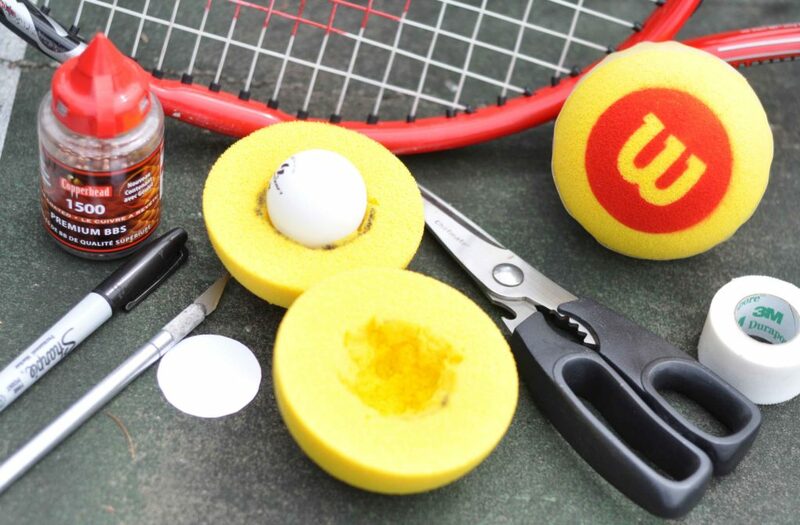 Dig out each side with scissors within the circle to fit the ping pong ball. Both sides should be able to close over the ping pong ball snugly. This is primitive, I know. If you have a better way, please let me know. Cut a small “x” with the xacto knife on the ping pong ball. The “x” should be big enough so you can push 3 bbs into the ping pong. Place the ping pong ball within the 2 foam halves and tape up. Voila! 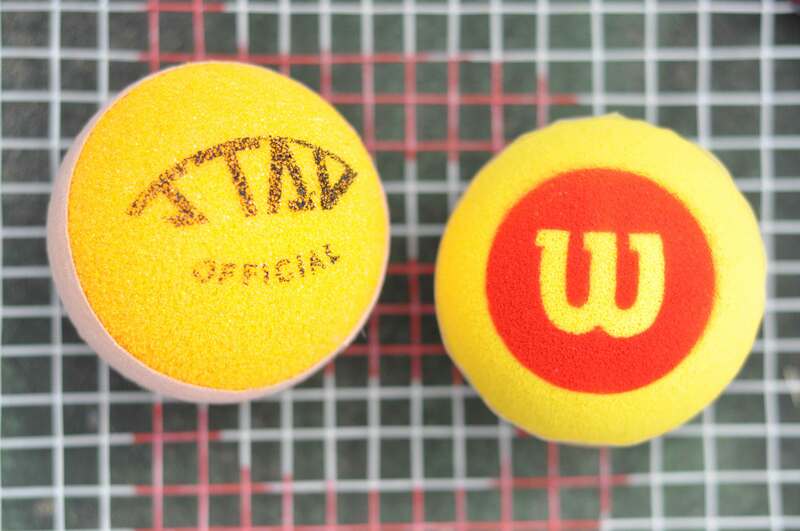 Your very own sound adapted tennis ball! So, you need a continuously beeping ball. I found this beacon http://www.braillebookstore.com/Wireless-Sound-Beacon.1 which you could attach to a larger ball. They also have a beeping Frisbee – but it is foam & perhaps easily destroyed. Here is an object locator from the braille book store which also may work, http://www.braillebookstore.com/Object-Locator.1. You also might look into a beeping baseball – this may be your best bet, http://www.nbba.org/equipment.htm . Good luck! Oh, I hope it does! They don’t really make a noise in the air, though, only when they bounce She might like tennis, too Good luck! Found this while looking for T ball s for my daughter. Her vision is 20/200 in her good eye and we are currently using a foam toddler bat since it has more surface area instead of a regular bat. I thought that if we had a ball that made noise and / or was a bright color it might help. She is loving it and I can’t wait to see how something like this might help. I have a dog that loves ball but recently went blind and she can no longer see the ball to find it. I have been searching for awhile for a tennis ball that makes noise but this is the first good idea I have found, thank you for posting! We didn’t really have any trouble cutting them, but your cuts are probably much better than ours :). Yes, the tape does fail after awhile, but I was pleasantly surprised on how well they do bounce just being taped. Let me know what you come up with, I would be interested to know….we’ll be having another blind tennis camp around here in July. To make a better cut without making too much rips on the foam balls, you could soak it with water ( sequeeze a little to make the ball sponged with water. Then fridge it for couple of hours. When it’s taken out and being cut, the process is like a hard foam being cut. After the cut, thaw and leave it to dry. We’ve found the tape affects the bounce and the way it’s glued from two halves cracked easily after a while. Currently expermienting with different ways to make them. Thanks, Rose! You’re so sweet. The tennis team kids helped out so it went pretty fast. Dena, I’ve been so busy this week (and last) that I haven’t posted or been on to check my comments! Blind tennis camp was this past week July 27-July1 at the high school in the late afternoon. I think all of the kids (blind and non-blind helpers) enjoyed themselves. You’ll have to come watch next year. I was wondering when I would hear from you again. I was missing your posts. Will the tennis camp be held at the Snohomish High School tennis courts? When? I’d love to come over when it happens. Tell Miss G how proud I am of her. You are brilliant and kind and clever and smart and hilarious and Miss G. is following in your footsteps!! I am so proud of her for doing this camp!